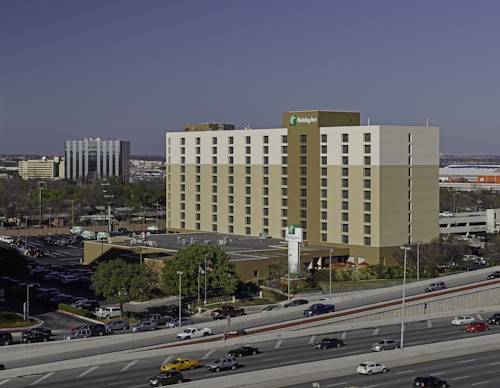 The Holiday Inn Hotel San Antonio International Airport (SAT) offers you our famous Texas hospitality along with an ideal location. We're one mile from the airport and seven miles from downtown San Antonio. Few hotels in San Antonio, Texas are so convenient for leisure travelers. We're just off Loop 410 making it easy to get around the city to see The Alamo and River Walk or to shop at the nearby North Star Mall. SeaWorld San Antonio is just 20 minutes from us. Business guests love the free amenities at our hotel in San Antonio; the free 21 hour airport shuttle service, high-speed, and Wi-Fi Internet access make travel easier. Fort Sam Houston is eight miles and both Trinity and Incarnate Word University are only four miles. If you're in town for meetings check out our 10,000 sq ft of meeting space for 650 guests. Few hotels at the San Antonio, TX airport can match our amenities that include executive work stations, mini-fridge, and microwave in each room. There's an upgraded Fitness Center, gorgeous outdoor pool, whirlpool, and guest patio. You can savor the tastes of Texas at our restaurant with herbs from our garden or relax in the lounge. You'll see just how friendly Texas can be when you choose one of the finest airport hotels in San Antonio, TX and Stay Green with us. Bravo Grill provides guests a warm, relaxed atmosphere. Delightful menus serving breakfast, lunch and dinner daily. Private dining areas available with advanced reservation. Perfect for dinner meetings. Java Express features fresh Starbucks coffee, expresso, cappuccino, gourmet deli sandwiches, croissants, assorted baked goods and beverages. Main ballroom for the hotel that will divide into 3 sections. Located on the ground floor near the lobby area. Multiple seating options from reception to classroom style. Rio Grande Ballroom is the Junior Ballroom at the hotel. Located on the ground floor near the East Entrace to the hotel. Conveniently located to the hotel side entrance and the elevators. Room 2A is one of four small meeting rooms often used as a breakout room for larger groups/conferences. Located on the second floor convenient to guestrooms at one end of the hallway and restroom facilities. Room 2C is one of four small meeting rooms often used as a breakout room for larger groups/conferences. Located on the second floor convenient to guestrooms at one end of the hallway and restroom facilities. Room 2D is one of four small meeting rooms often used as a breakout room for larger groups/conferences. Located on the second floor convenient to guestrooms at one end of the hallway and restroom facilities. Room 343 is an Executive Conference room located on the 3rd floor level of the hotel. Rio Bravo is a small meeting room located on the main floor convenient to the lobby and front desk area. Many times used as a registration room due to the location. Children's program - SeaWorld & Six Flags Fiesta Texas nearby. If you park your car in neutral, "child ghosts" may push it about 30 feet up a slight hill, onto a spot formally crossed by railroad tracks! The tracks were later removed -- but the ghosts won't leave. ~14 miles from San Antonio. Big strawberries and strawberry art can be found around town, which holds an annual strawberry festival. ~33 miles from San Antonio. The "Pecan Capital of Texas" regained the title of World's Largest Pecan in 2011 (which it had lost to another giant pecan in the 1980s) with this 16-foot-long, 8-foot-wide creation. ~32 miles from San Antonio. Crowds gather every evening to watch 1.5 million Mexican free-tailed bats take flight from under the Congress Avenue Bridge. ~68 miles from San Antonio.